This superb quality, highly restricted limited edition from the studio of the world’s pre-eminent aviation artist, having prints endorsed with the original signatures of distinguished veterans that flew the mighty B-17 Fortress in the war-torn skies of Europe during the greatest air war ever fought. 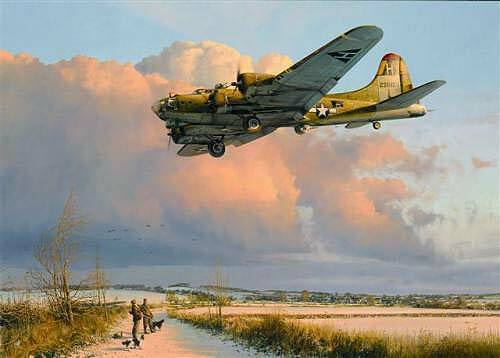 Robert portrays ‘Skipper’, one of the longest serving B-17 Fortresses of the war, returning to Thurleigh on a cold afternoon in late January 1945. Flying with the 367th Squadron of the 306th Bomb Group, ‘Skipper’ was badly damaged in November 1944, repaired and returned to service to finish the war with over 100 combat missions flown. Depicted here, the bare metal replacement section in the tail, and several flak patches, have yet to be repainted by her busy ground crew. With the aid of Robert Taylor’s sensitive representation, it is not difficult to imagine the thoughts and feelings of the returning aircrew as they see the runway at Thurleigh stretched out before them, welcoming them home as they make their final approach. An outstanding and invaluable addition to the portfolios of all discerning aviation art collectors. with the Eighth Air Force in combat during World War II.